“Taming the Twisted” is an historical fiction novel by Jodie Toohey set in 1860. Although Abigail Stickey enjoys spending time with her parents and younger siblings on their farm, nothing has brought her more joy and happiness, than planning for her future with her fiancé, Joseph Sund. That is, until one particular Saturday in June, when Joseph comes to call on her and informs her that he is leaving town and ending their engagement. The news catches Abigail completely off guard and she runs off in tears. While Abigail is nursing her broken heart, she doesn’t notice the storm that is rapidly approaching. This is no ordinary storm; the formation of twin tornadoes rip through the town of Camanche, Iowa, destroying the family farm, and killing her parents. Even as Abigail works to provide a life for her siblings in the aftermath of the storm, she cries for Joseph. She wants to confront him and let him know how hurt she is, but no one has seen him since the storm. It wasn’t until Abigail overheard some of the men in town discussing another local, Marty Cranson, that Abigail started trying to piece together what she believes could be the real reason Joseph left town. It appears that Marty Cranson was murdered right around the time Joseph disappeared. Abigail knew that Joseph and Marty did not get along, she even witnessed the two of them arguing just weeks before Joseph left town. Did Joseph really leave town because he had something to do with Marty’s death? What started out as Abigail’s search to understand why Joseph ended their engagement, turns into Abigail investigating a murder. 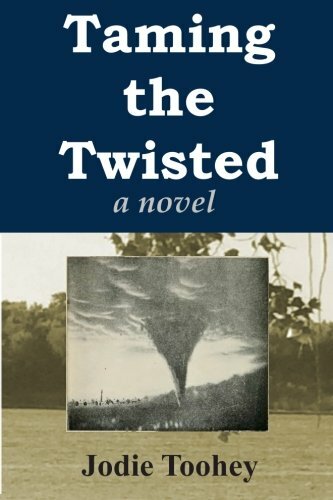 Jodie Toohey’s “Taming the Twisted” brings the devastation of Iowa’s Great Tornado of 1860 back to life as she wonderfully describes the overwhelming challenges the main character, Abigail Stickey, must face after the tornado destroys her town. I found Toohey’s story of love, mystery, betrayal, and misgivings to be a very compelling and quite interesting read. I do recommend this story for those who enjoy historical fiction. One thing I will point out though is that I would have like to have seen more depth built into each of the characters. All in all, though, the story held my interest, and was an enjoyable and easy read.